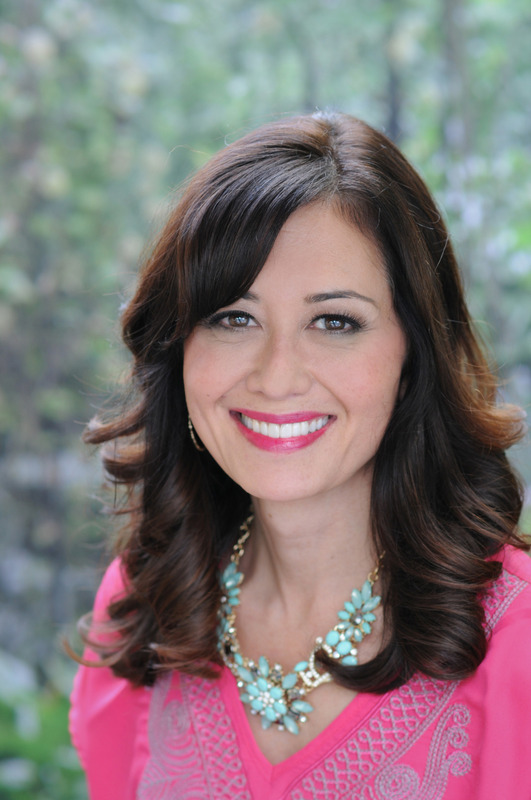 Catch these ideas LIVE on Seattle’s KOMO-TV Monday Feb 10th at 4 pm. Valentine’s Day is next week, and for many of us that means treating our sweetheart to breakfast in bed or to a romantic dinner for two. 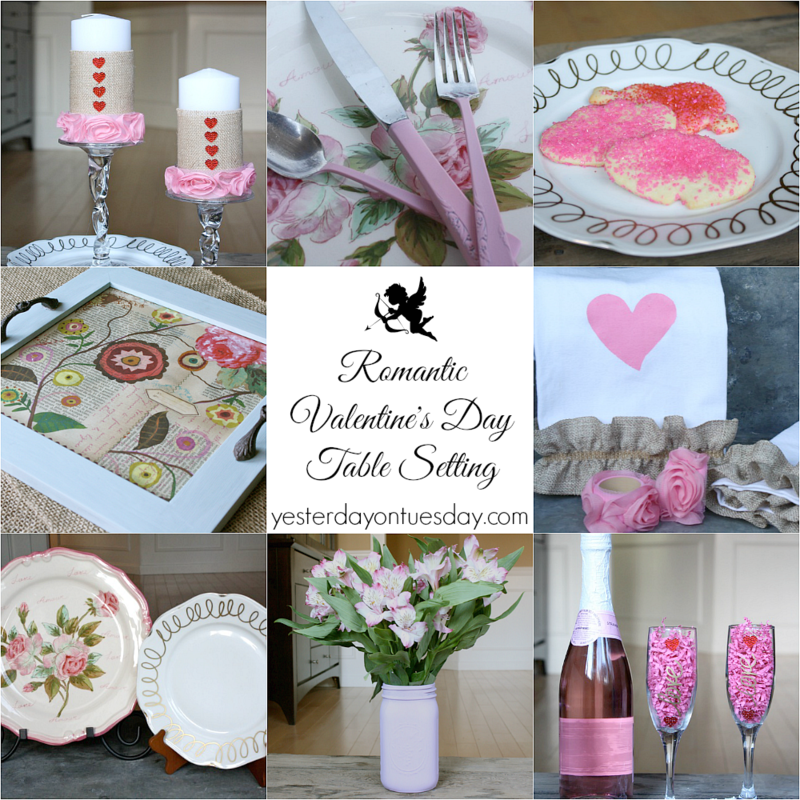 Here are some ideas for making your Valentine’s Day table extra special. First stop the thrift shop! Hit your local secondhand store create a lovely table without spending a ton of money. You can find all sorts of treasures there. 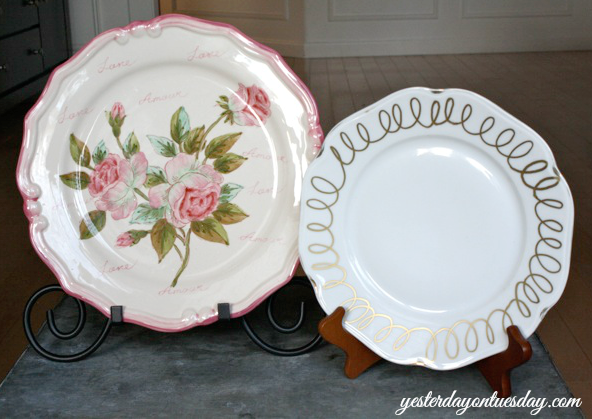 I scored two rose plates for a few bucks. And while they weren’t the same color scheme as the rose plates, I also found a couple of white gold edged salad plates at the same store. 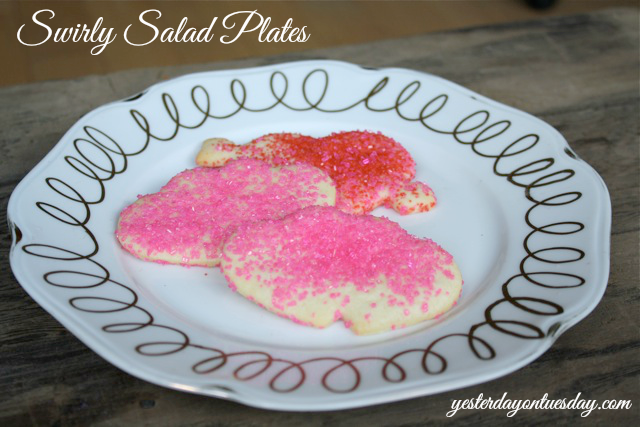 I liked that the shapes of the dinner plates and these white salad plates were similar. While I loved the simplicity of the small plates, I felt that they needed a little something more. Supplies: Plate, Gold Sharpie Oil Based Paint Pen, rubbing alcohol. Directions: Wipe the plate down with rubbing alcohol. Draw swirls on the edge of the plate. Let it dry and follow package directions to cure. 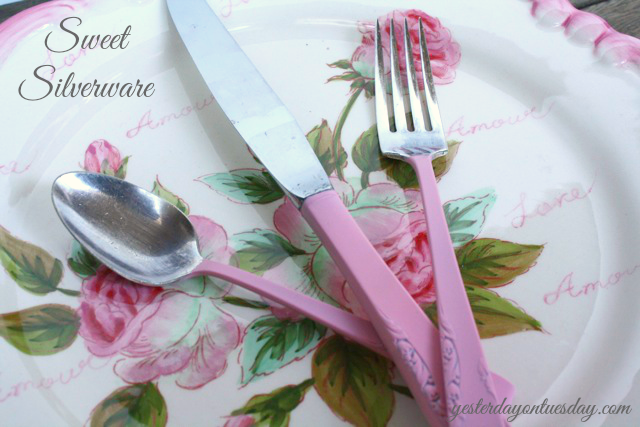 Another fantastic thrift store find– mismatched pieces of silverware. Grab two knives, forks and spoons (it doesn’t matter if they match). 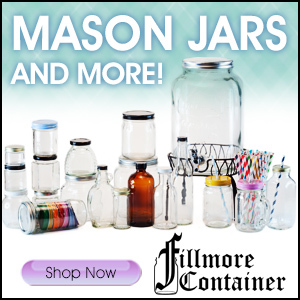 You can find them for as low as twenty-five cents apiece! I fell in love with this floral pattern picked up these for a steal. With the help of some pink spray paint, they were transformed. Supplies: Vintage silverware, spray paint and masking tape. Directions: Clean the silverware and tape off everything but the handle. Following the directions on the can, spray paint the silverware. Clean the part of the silverware you’ll be eating with again. By the way… what’s more fun than PINK silverware? There’s one more too-good-to-miss item that’s worth picking up at the thrift store… champagne flutes. They are easy to personalize. Supplies: Champagne Flutes, Gold Sharpie Oil Based Paint Pen, rubbing alcohol. 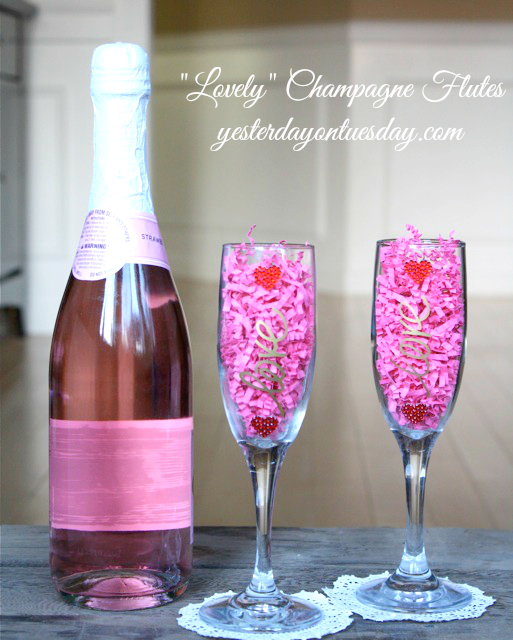 Directions: Wash the flutes and clean them with rubbing alcohol. Using the paint pen, decorate them. 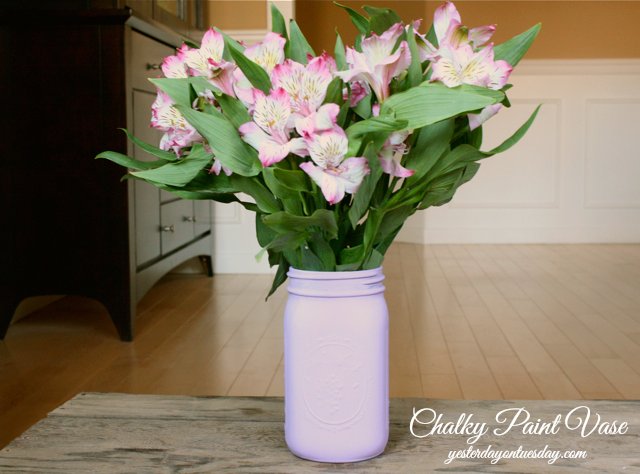 Supplies: Wide Mouth Mason Jar, paint (I used Chalky Finish by DecoArt). Directions: Apply three or so coats of paint (letting each later dry) and add flowers. Set the scene with this romantic tray… made out of a twelve by twelve inch scrapbook frame! 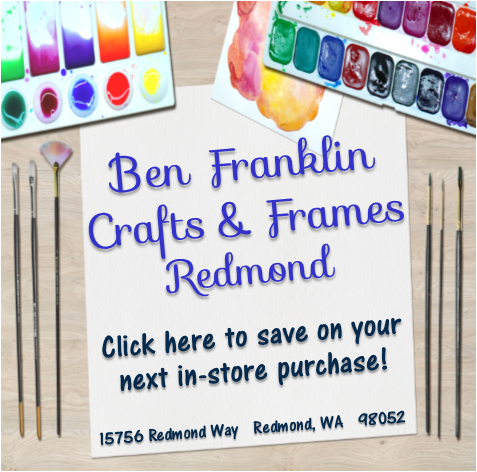 Supplies: A 12″ by 12″ scrapbook frame (with a wide frame), paint, handles, E-6000 glue and a piece of scrapbook paper. Directions: Remove glass from frame. Paint it (may take up to three coats) and let it completely dry between coats. Remove the screws from the handles and glue them to the frame with E-6000. Let it dry completely. 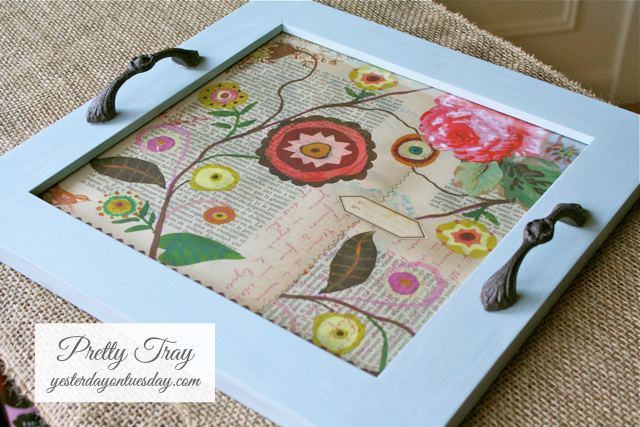 Add a piece of scrapbook paper. Upgrade plain napkins with paint and ruffles! Supplies: Plain white cloth napkins, paint, contact paper, a cookie cutter, ruffles and hot glue. Directions: Create a heart template or use a heart shaped cookie cutter to make a heart shape on the contact paper. Stick contact paper on napkin and paint. Let it dry. Add ruffles with hot glue. Supplies: Plain wooden napkin rings, acrylic paint, “rose” ribbon and hot glue. Directions: Paint the napkin rings. Add ribbon with hot glue. 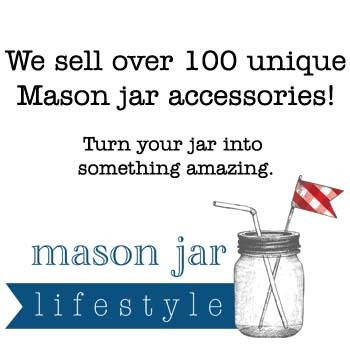 Spruce up plain candles and candleholders in a jiffy! 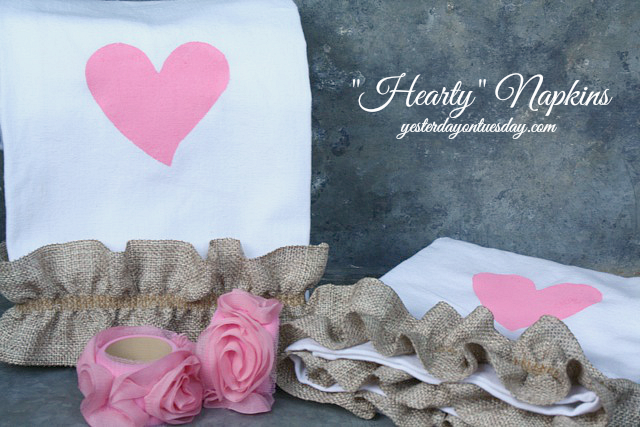 Supplies: Burlap, heart stickers, rose ribbon and glue dots. Directions: Cut burlap to wrap around candles and secure with glue dots. Add heart stickers. 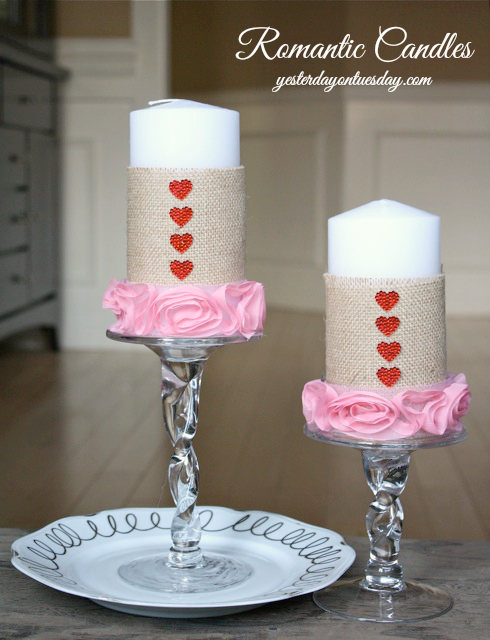 For candle holders, add rose ribbon and use hot glue to keep in place. Transform a plain trivet into a something sweet. 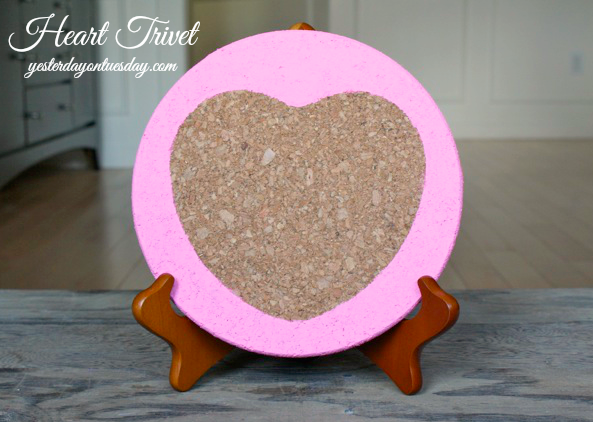 Supplies: Plain cork trivet, acrylic paint, contact paper, heart template or cookie cutter. Directions: Trace heart on contact paper. Stick contact paper on trivet. Paint empty spot. Let it dry. 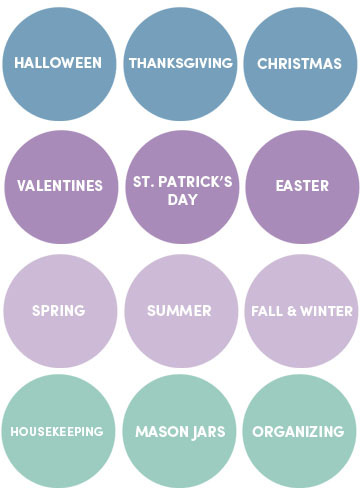 Find all these ideas and many more at Hometalk.com, hashtag #ValentinesDay. 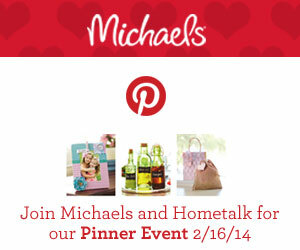 I’m excited to participating in a nationwide Pinerest Event on Sunday February 16th in Kirkland! I’ll be there from 1-4. 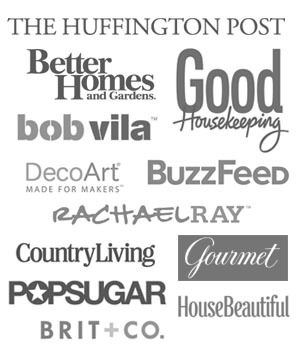 We will be putting our own spin on some popular Pinterest projects! I hope to see you there. How pretty! I love your trivet idea and all of your special touches. I love your ideas, especially the champagne flutes and the burlap candles. 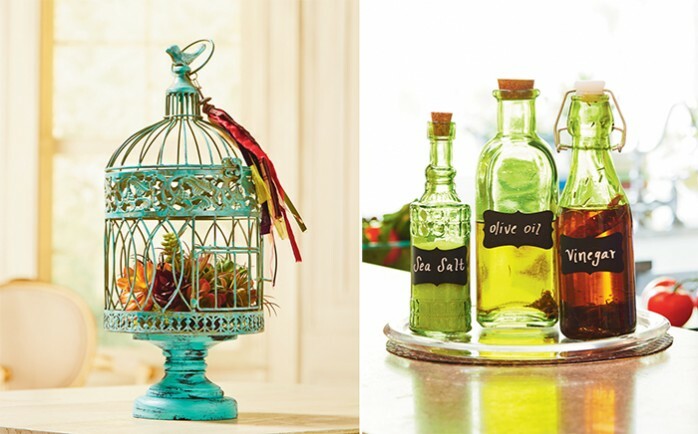 I may use some of these ideas for my sister’s bridal shower. Thanks for the inspiration!